Last month’s challenge featured our Halloween/Fall Pillow Kits from Cutting Edge Stencils. You can take a peek at my Crow Pillow HERE if you haven’t checked it out yet. This month, we are excited to be teaming up with Cutting Edge Stencils again! 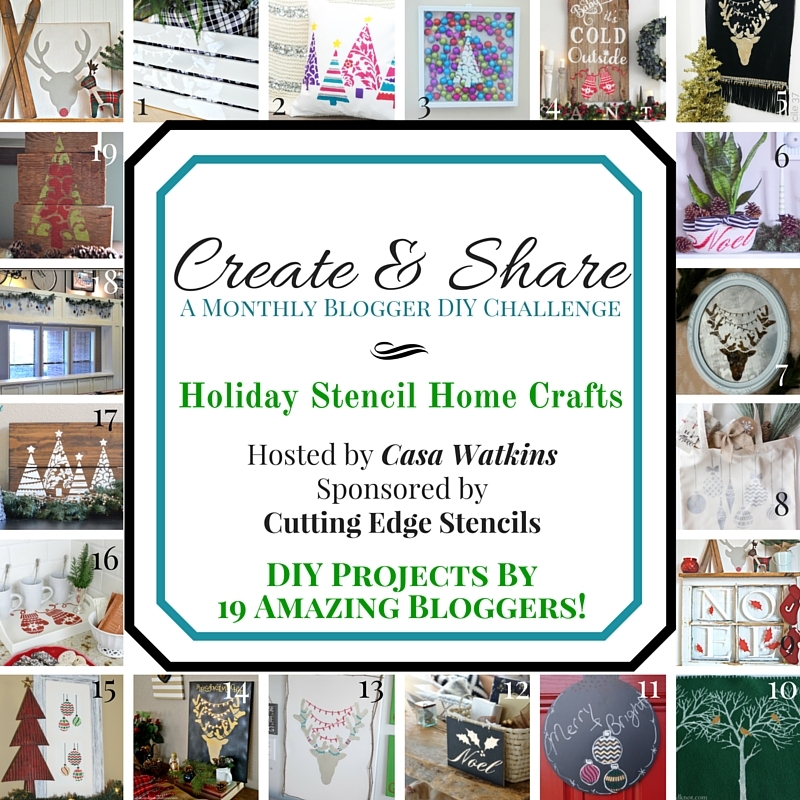 Each blogger chose a holiday stencil to be used as they wish. They are such an awesome company and have high quality products. I can’t say that enough. To add to the fun, they are giving away FIVE Cutting Edge stencils kits, valued at $50. Be sure to enter for those awesome prizes at the bottom of this post. The stencil I chose from Cutting Edge Stencils is a reindeer. I purchased a wooden crate from Michael’s for the project. As a side note, our home is very white! It’s a great mix of farmhouse, industrial and cottage. I wanted this box to appear old, vintage and “not perfect.” Here’s what I did: I painted the crate with Sherwin Williams Passive Gray. I then taped the stencil to the crate. Using a stencil brush and white paint, I lightly applied the white paint. After I removed the stencil and let it dry, I used sand paper and distressed the crate front and reindeer. I love the look the sand paper gives the reindeer! The crate is perfect for our small, but real Christmas tree. I just love having real trees, big and small, throughout our home. I used a flannel table cloth to fill and cover the tree base. Oh flannel, I LOVE you this Holiday season 🙂 This crate matches well in our home. It will be perfect to use each year for the Holidays. I could put logs, lights and greenery in there, blankets …. the options are endless. I love how the rustic/distress look matches the concept of him “hanging off” the crate. It turned out perfectly. Be sure to browse the other blogger’s ideas below and enter in the giveaway! Also, check out all the Holiday stencils over at Cutting Edge Stencil. Thanks for stopping by! What a cute idea! I love the crate! Adorable! I have a couple of crates in the garage that I think I’ll be updating like this now. Love it! Oh yah!!! Have fun, I know they will be beautiful. Sara this is SO cute!! I love that gray color! When I run out of the quart of gray that I have currently I will definitely be buying some of that Sherwin Williams color! I really like how the blue plaid flows with the gray and white. Great job!! Thanks Sydney! Yes, I love that gray too!!!! Hi, Sara ~ This looks so amazing! And I love the idea of the crate. I totally agree with you that the sandpaper was a beautiful effect. Such a wonderful project! Hey, Sara! Love this idea of putting a small tree in a crate, especially one as cute as yours. And I completely agree about the flannel–it looks perfect! Thanks Sharon! Yes, the crate is perfect for the tree! I’ve now moved the tree into a large crock. Why must I redecorate ALL the time?! Your crate turned out beautifully! What a great use of your stencil! Next year I think I am going to have to make a different tree stand and I love your idea. Thank you for sharing! Pinning! Thanks Cat! Yes do it, it’s a fun twist on the tradition stand/skirt! So many options! Thanks April! I wasn’t sure if the angle would “work” but I like it! This is adorable!!! Your tree looks perfect tucked in there! Thanks Amanda! I’m loving our new little tree stand! 🙂 Happy Holidays! Sara I love how your crate turned out! It compliments your home perfectly! I love the crate, such a great idea! Thanks Katy! It was a fun project! This is really creative. Your photo skills are on point and I like how you placed the reindeer in an angle. Love the color too! Love this idea Sara!!! Very creative. The colors you used are so beautiful too. A wonderful Shabby Christmas!! What a great way to dress up such a simple item! I love the way it turned out. This is just darling and so creative! This really turned out great!!! I’m so excited to see how fast this challenge is growing! I’m so glad you’re a part of it!! xo!